Camp Bates Children’s Program offers engaging programming for children ages 4 to 13 on Friday evening, Saturday morning, and Saturday evening. Children must be pre-registered ($25 per child) to participate. 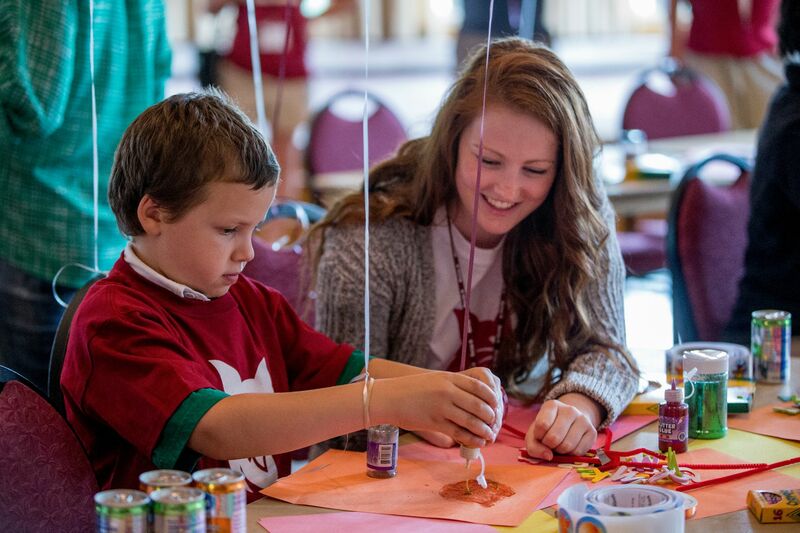 If you are bringing children too young to attend Camp Bates, please contact us at reunion@bates.edu or 207-755-5976 for a list of babysitters. Join award-winning children’s book author-illustrator Matt Tavares ’97 for a reading of Zachary’s Ball, and hear the story of how his senior thesis at Bates became his first published picture book. Matt will also give a behind-the-scenes look at his process of writing and illustrating children’s books, followed by a drawing demonstration and question time. Join Victoria Wyeth ’01, the grandchild of American artist Andrew Wyeth, for an interactive and family-friendly art activity. Victoria draws on her experience leading children’s programs at arts museums across the country and offers a unique approach to the creative process. Includes a ferris wheel group activity and Bates Build game (with marshmallows and spaghetti noodles). Decorate and enjoy your own Bobcat paw cookie! Decorate your own visor, make your own pinwheel, and join counselors for summer games. Join Victoria Wyeth ’01, only grandchild of American artist Andrew Wyeth, for an interactive and family-friendly art activity. Victoria draws on her experience leading children’s programs at art museums across the country and offers a unique approach to the creative process. Please note that no photography is allowed during this presentation. Parents are encouraged to include their little ones in the Reunion Parade and barbecue picnic lunch. Inflatable Bounce House, Field Sport Playtime and a Bobcat Adventure! SeaDog Biscuit ice cream sandwiches and a special appearance by the Bates Bobcat! Campers will participate in one or both of two activity stations: a lifeguarded swim with camp counselors and/or various games and activities in the Merrill indoor track complex (hide-and-go-seek, tag games, dodgeball, tennis, rockclimbing and more). Roast marshmallows and tell stories!